My Response to David Mason – Huh? You lost me with your latest contribution, “Secrets of the Book Trade: Number 1“. I sorrily admit I didn’t understand a word of it. I followed you as far as the admission that antiquarian booksellers are snobs – agreed, and good for you! – but the following generalizations about trade bookselling sounded outright made up. Which booksellers, pray tell, were you referring to? I’m not sure if you’ve looked around lately, but there aren’t a lot of trade booksellers left, and those still standing don’t bear any resemblance whatsoever to the characture you’ve drawn. “…what they are lacking is knowledge of about 500 years of the history of their trade.”? “new booksellers share with publishers is a certain distrust – even fear – of antiquarian booksellers”? “You order a bunch of books from a catalogue, provided by a publisher, sell what you can and return what you can’t. No risk, no penalty, if your opinion of what might sell is wrong.”??? The above quotes represent three total untruths about trade bookselling featured in your essay. Just this week Ben McNally delivered the 2012 Katz Lecture at the Thomas Fisher on the topic of Is There a Future (Or Even a Present) for Bookselling? which included a learned history of the book trade. 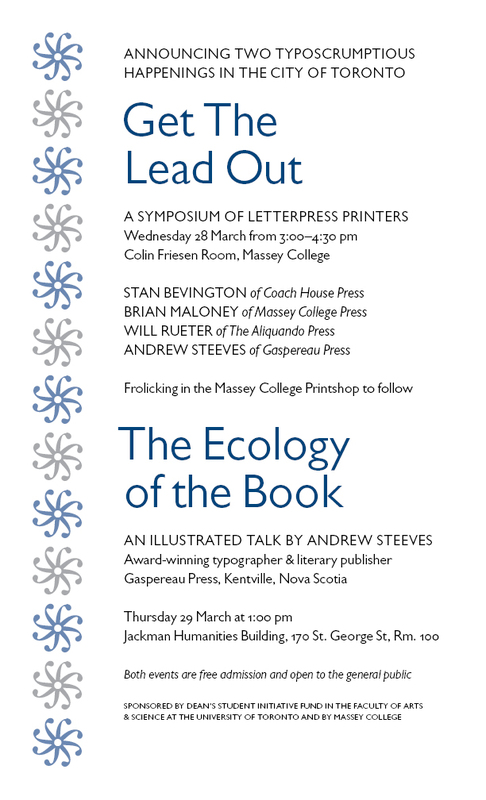 Yesterday I attended new book creator Andrew Steeves‘ lecture on “The Ecology of the Book” which also consisted, largely, of a history of the book trade. Even I am a new book seller and a book historian, not to mention an antiquarian book lover and collector. The booksellers I know – those who remain – are very knowledgeable people who are in no way the peddlers of pap you seem to be describing. I think you and I can agree that Chapters/Indigo is not staffed by “booksellers” so let’s leave out their lack of participation in the larger world of books – unless it was actually that straw man you meant to burn down, in which case I’d feel better if you’d been a little more clear. We bear the antiquarian trade no ill-will. In fact we continue to foster relationships with used and rare sellers. Our remainder tables continue to be pillaged by scouts and dealers, and we offer deep discounts to some favoured dealers who will take away our overstock by the box. We know that the antiquarian dealers do us the same service we do them – redirecting customers who erroneously visit one or the other of us in search of “nice copies of…” or “cheap copies of…”. I send my customers to you weekly. I hope you do us the same courtesy. As to this business of publishers’ returns policies giving us a free pass… well, perhaps it is this which stuck in my craw the worst, as I hear it again and again from everyone, customers, academics, and now you, who should know better. The ability to return a limited quantity of books allows us nothing but the merest bit of breathing space. We have to remainder or toss books too. We have to vet the vast, vast floods of new books which are solicited each year into a good, salable collection of which we can return no more than 15% and, even then, which we often have to return at great cost to ourselves in shipping and brokerage – especially brokerage. Choosing which books will sell requires not just an intimate knowledge of every author, publisher and subject we cover, but of our customers and their interests, price points, and whims. Every book we buy is a gamble. Unlike you, who can pick up certain Modern Firsts at a good price without having to think about it, we have to speculate on the market of every book which comes through the door. And we can only be wrong 10-15% of the time. Further, if we feel a social responsibility to pick up and flog new, upcoming authors and presses with no existing market whatsoever in the name of encouraging local talent and the potential cultural giants of tomorrow, we do so by the grace of this returns policy. Not that we send books back to small and independent publishers – quite the contrary, we have a policy of keeping these books whether they sell or not, out of respect for the limited resources of their publishers. But we can do it because of the returns to larger publishers who can afford it, which will let us free up some cash for zero-gain experiments. I cannot imagine what point you will eventually make with Number 2 of this series after making such an artificial distinction between booksellers in Number 1. If your intention was merely to point out how very learned you are, I salute you but suggest that you do not become more learned by painting us as less learned. I’d like to suggest that a more useful project might be to make common cause against the real outsider in our field, the entirely algorithm-based online bookseller who is undermining both our businesses by selling entirely unvetted, undifferentiated texts based on price point alone. But that’s another post. In conclusion, I think you’ll find those booksellers among us who remain in business in this difficult age are a hardy bunch, creamier than whatever booksellers of yesteryear you’re remembering. We each have our bodies of knowledge about aspects of the objects we dedicate our lives to. We are aware of how we compliment each other – have we kissed and made up yet? P.S. I would love and prefer a job in antiquarian bookselling. If you’re ever looking for a knowledgeable and neurotically dedicated apprentice, you just let me know. It’s not often that I outright plug an upcoming event, but this one came at me kinda last minute and I have been rather lax about keeping my regular bookish event listings current. Also, I will be attending, so think of it as an opportunity to come see me! In his 2003 A Splendor of Letters: The Permanence of Books in an Impermanent World, Nicholas Basbanes tells the memorable and, speaking as a bibliophile, devastating story of the Houghton Shahnameh. 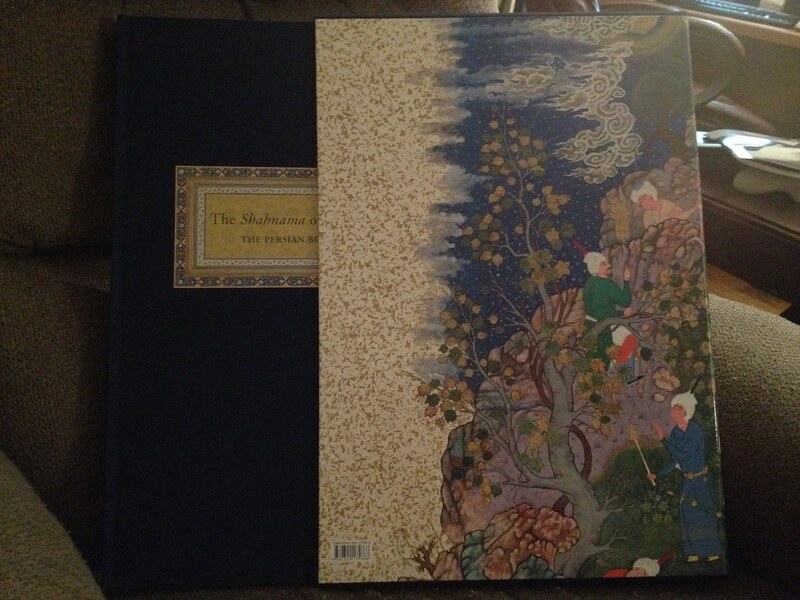 The story goes like this: Arthur A. Houghton Jr., a 20th-century American book collector, has among his insanely valuable books a manuscript which has been described as the most spectacular example of Islamic art, if not of manuscript art, ever produced: The Shahnameh of Shah Tahmasp. This copy of the Shahnameh (a 50,000 line poem first put to paper in 1010 by the Persian poet Ferdowsi) managed to survive intact from its creation in the early 16th century until the 1970s, when it ran afoul of Houghton. Houghton acquired the manuscript from Baron Edmond de Rothschild in 1959 and almost immediately put it on deposit at Harvard University with “the understanding that an elegant facsimile would be published by the university’s academic press.” (Basbanes 2003) Then, for whatever reason, he abruptly withdrew it from Harvard in 1972 and donated 78 of the most valued pages to the Metropolitan Museum of Art. Yes, he cut out seventy-eight pages and gave them away. Long story short, a priceless treasure of book art was destroyed by a single owner. But all was not entirely lost: in 1981 Harvard University Press did manage to produce a facsimile in two volumes, 600 copies of which were actually sold to the public. Nowadays you can get a copy of this facsimile for the comparatively low price of $3500-$4500. Ever since reading Basbanes’ tale in 2003 I have been mad to own a copy of this facsimile. It was absolutely in my top-5 list of books I’d buy if I, you know, had the resources to spend on collecting that I wish I did (along with Frank Wild Reed’s Bibliography of Alexandre Dumas and the 1893 deluxe edition of the Beardsley-illustrated Morte D’Arthur, in case anyone wants to get me an especially lovely birthday present). And so I nearly had an aneurysm when I saw the solicitation from Yale University Press for a new facsimile: The Shahnama of Shah Tahmasp. Now, I couldn’t buy the deluxe edition. But I’ll be damned if I’d let a book I’d been fantasizing about for the last decade go totally un-bought. I picked it up yesterday from the Bob Miller Book Room. Being, as I was, at headed for the Bob Miller Book Room, I thought I’d take the family to the Royal Ontario Museum for Maggie’s Daily Dose of Dinosaur and, lo and behold! They are currently showing a special exhibit on the Shahnameh! Among the ROM’s holdings are pages from another great Shahnama manuscript also broken up during the 20th century, the Great Mongol Shahnama. These and other pages on display from McGill University and other sources represent a rather depressing history of decontextualizing Islamic art, but that’s a post for another day. As an introduction to the stories and cultural value of the Shahnameh, the exhibition is absolutely worth seeing. 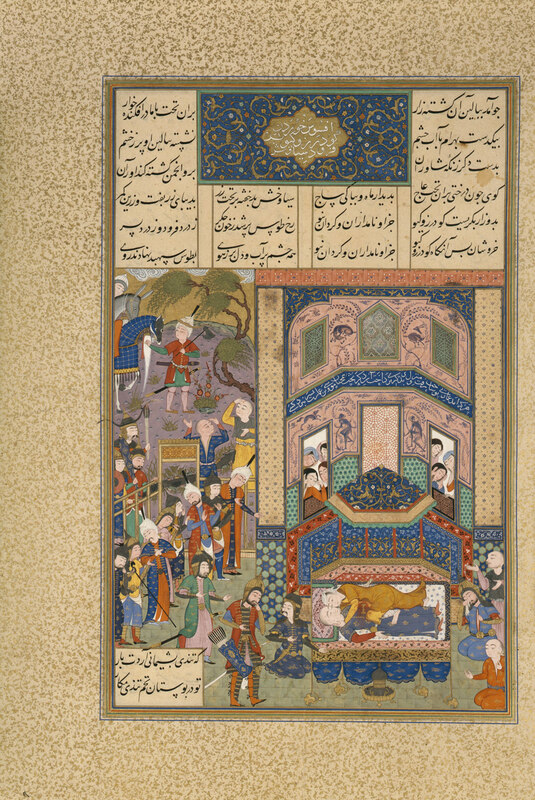 They even have a copy of the 1981 Houghton Shahnameh from Harvard on display – “The most luxurious and lavishly illustrated royal manuscript” preserved to “document and contextualize…” the illustrations. A context we only get now in facsimile, thanks Houghton. The ROM’s Shahnama – The Persian “Book of Kings” exhibit runs until September 3, 2012 in the Wirth Gallery of the Middle East, Level 3. The Toronto Comic Arts Festival is one of those events that I budget my whole life around for an entire quarter. Which is funny, because if all you know of me is what you learn from this blog, you might not have me pegged as much of a comic geek: I tend to blog about book collecting, book-as-object issues, bookselling and Canadian literature. Comics, a huge subject on their own, I tend to pass over for other things. The truth is that I am a bit of an outsider when it comes to comics. I’m aesthetically barren and not especially hip, yet not nerdy enough for mainstream comic geekery. I encounter and consume graphic novels with a kind of layman’s how do they DO that??? awe. There’s no doubt that I love the finished product, but I have little to no insight into the techniques, styles, influences, communities and trends that come together to produce the work. However, there are a few things I can say for sure. FACT: TCAF is one of the best, if not THE best, non-mainstream comic shows in North America. FACT: Toronto itself has produced a disproportionate number of incredibly influential comic artists and cartoonists, suggesting there’s something to the community here (or maybe just in the water) that’s creating a comic arts nursery. FACT: The Beguiling, the instigator and host of TCAF, is just about the best comic book store ever. FACT: The graphic novel is becoming an increasingly legitimized literary form and TCAF is probably the single best place to learn about and buy the best and brightest of the form. 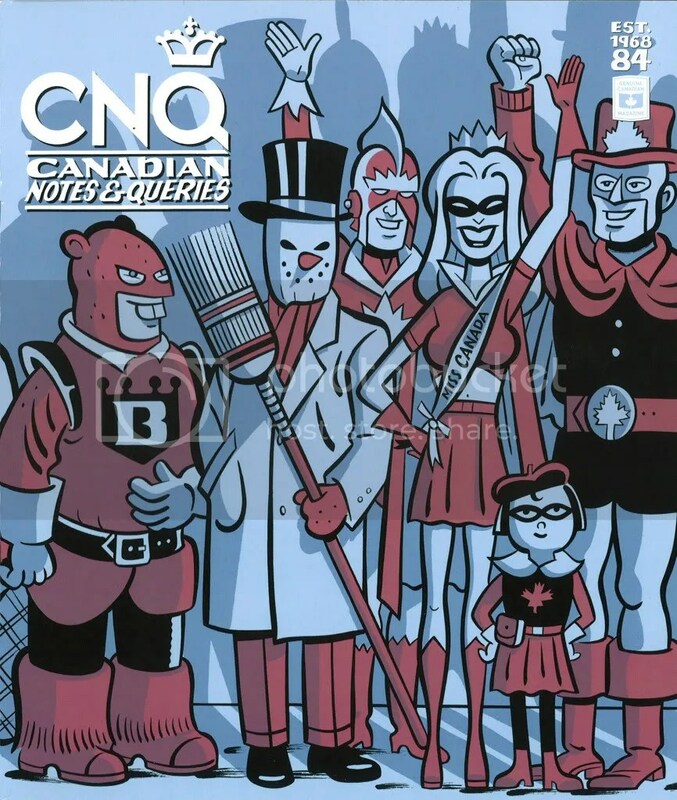 Last year I posted 5 Things That Will Be Totally Amazing About TCAF 2010, and the year before I discussed The Toronto Comic Arts Festival and Why a Book Collector Should Care. This year I admit I have nothing to add to those points. But the importance of TCAF hasn’t lessened any, so consider this a simple reminder: Get out there! The launch party is tonight, and the Toronto Reference Library will be packed to the rafters with vendors, exhibitors and panelists Saturday and Sunday (May 7th & 8th). The show is free so there’s virtually no reason not to check it out. It’s even kid-friendly. Aside from being a colourful spectacle of the graphic and literary cutting-edge, there’s also a whole rooster of kid programming. It has been a good spring for book festivals so far! Last night I attended the 17th annual Gryphon Lecture on the History of the Book for the Friends of the Thomas Fisher Rare Book Library. The lecturer this year was the very prolific and always amazing Prof. Linda Hutcheon speaking on, to my delight, “Book reviewing for a New Age”. Well well! Though Prof. Hutcheon is an academic and the Thomas Fisher is an institution within the University of Toronto, the Gryphon lecture is intended for a “layman” audience of supporters and friends. Unlike so many talks I’ve attended on book reviewing and the internet, the audience here was entirely devoid of persons employed by the publishing industry. These were readers, heavy ones, and especially, readers of print book reviews. So understandably, much of Hutcheon’s talk was aimed at making a case for digital forms of book reviews, and what they offer to readers. In this regard, she was not tremendously successful. She began with outlining the decline of the print review, giving us a good history of which papers have scrapped their Books sections and why. The reasons given by the papers and by Hutcheon were all economic: it is no longer, apparently, worth it to a publisher to buy advertising at the same rates and quantities in print. The blame for that has been placed on the internet, probably rightly. The same advertising budget now has to include websites like Amazon.com, the lit blogs and the review copies given out through the thousands of social media channels. The decline of print reviews has been matched by a much larger increase, however, in digital reviews. All signs point to an overall increase, rather than decrease, in engagement with books. Hutcheon explored at length the “economic, political and ethical” implications of this new divide. I’ll leap ahead to the end in order to justify my opinion that she ultimately failed to make her case, however: no matter how many good points she made about the value of a more democratic engagement with books, or about increased readerships, the discussion never came full circle to re-include the print reviews. Ideally, she argued, print would broadcast the paid reviewer’s specialty: reviews with a “broader cultural scope”; expansive, reflective articles from persons who (ideally) are more professional and accountable than the customer-reviewer of the internet. Which sounds like a brilliant idea, but it doesn’t explain how this is going to be paid for. If publishers haven’t the advertising budgets to maintain Books sections in newspapers across the Western world, I don’t think it matters whether they contain snappy, puffy reviews or expansive, global-scope ones. Who’s paying for it? The internet has split the same dollar, and I don’t see either new money being added to the pile, or the internet losing it’s advertising appeal. In any case, Prof. Hutcheon made some lovely and eloquent observations about the literary bloggosphere that addressed our weaknesses and highlighted our strengths. Though the most-often cited advantage of internet reviews is the “democratization” of the process – now anyone, anywhere can (and does) have a platform to let their views be known and the “tastemakers” or “gatekeepers” are losing their grip. But Hutcheon rightly points out that more noise doesn’t necessarily mean more dialogue – after all, can it be a dialogue if nobody is listening? Can critics have the same effect on our “cultural consciousness” if the discussion isn’t being broadcast (vs narrowcast) to a large audience? This is certainly a fair critique of the lit blog formula. Regardless of how measured, professional and well-spoken a blogging critic is, if he or she doesn’t have the same impact on the public sphere that the Globe and Mail, New York Review of Books or Times Literary Supplement has, the role of the critic in society is being diminished. That customer-reviewers are a wonderful marketing tool is pretty inarguable. But are they anything else? A blogger isn’t as much a taste-maker as a taste-matcher; after all the reader can always go to another reviewer if they start to sense that her tastes are diverging from the reviewer’s. Hutcheon advances the suggestion that online reviewers are “cultural subjects” (after Pierre Bourdieu’s “Political Subjects”), meaning that even if they might not be the focus of a cultural turn or shift, they can at least be the subject of the discourse on culture – and I would take this to mean that the bloggosphere as a whole can be spoken of (“the blogs are saying…”) rather than specific blogs. This certainly has an egalitarian feel to it – we the masses making cultural decisions rather than individuals in powerful (paid) positions. Hutcheon suggests bloggers and reviewers are motivated by the reputation economy and by, of course, love of the subject. So perhaps as cultural subjects our impact is freer from the politics of power. Except, I have to interject, I think that view of the bloggosphere as a rabble of altruistic amateurs happy to contribute freely to the dialogue is at least a little naive. The CanLit blogging scene, for example, is definitely blurring the professional/amateur line. Many of my favourite lit blogs are written by freelance print reviewers, and those that aren’t are written by people who, for the most part, have ambitions of becoming part of the paid “real critic” circle. Their blogs are, in this respect, proving grounds and elaborate CVs for budding writers and journalists who would be thrilled to death to be the next William Hazlit or Cyril Connolly. It seems difficult to escape the fact that the same people who are blogging are the people who are reviewing for the Quill & Quire, the Globe and Mail, writing for the Walrus, Canadian Notes and Queries, and the National Post, and publishing books destined to be reviewed by the same. It’s a small world out there. These are “customer-reviewers” to an extent, but it’s also becoming and increasingly legitimate in-road to becoming a professional critic. Even for those who have not made that leap to legitimacy yet, their contributions have to be read as something coming from someone who does consider themselves professional, even if no money is changing hands – yet. In any case, the audience of Prof. Hutcheon’s talk seemed interested but unmoved by her arguments for the cultural importance of lit blogs and customer-reviewers. The average age of the audience-member was probably 65 years old, and these are, don’t forget, a self-selected group of people who choose to donate money to a rare-book library. The question period certainly was dominated by incredulity and derision at the state of the print reviews. Still, it’s good to know these issues are reaching even these, the least-receptive ears. The dialogue is spilling out into a wider audience, and it will be interesting to see how the discourse develops as the institution of reviewing continues to evolve.